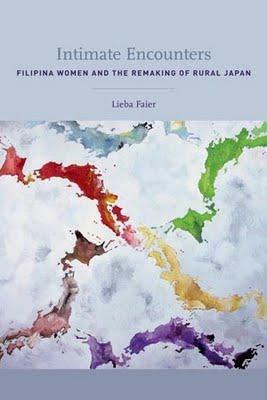 Intimate Encounters: Filipina Women and the Remaking of Rural Japan is a culmination of professor Lieba Faier's fieldwork in the late 1990s in the Nagano region of Japan, specifically Central Kiso. For a few years, Faier lived in the area, interviewing both the Japanese natives and the Filipina women who came to Japan under entertainment visas. The Central Kiso area had a particular phenomenon: a surprising number of foreign brides from the Philippines either met their husbands at the hostess bars where they worked or through mediated marriages. Faier discusses the two mentalities surrounding these Filipina brides: first, many Japanese thought they came from a poor and inferior country, and were looking for rich husbands; on the other hand, others viewed these brides as ii oyomesan, Japanese for “good wife.” Filipina brides who were viewed as ii oyomesan possessed “Japanese” qualities, such as being dutiful towards their husbands and in-laws. When interviewed, these women revealed that they were following their Filipina values. Even though many of these women came to Japan searching for a better life and a way to support their families back in the Philippines, many found obstacles. While their visas were for cultural performances, the majority worked in hostess clubs, where they were expected to please men and get them to drink. Many of the women performed sexual services, though it was a violation of their visas. If a Filipina woman did marry a Japanese man, she faced the disapproval of Japanese in-laws. Faier recounts stories of Filipina brides who ran away from their husbands, working underground when their visas expired. Faier's fieldwork is incredibly extensive, covering both Japanese and Filipina points of view. She does an excellent job portraying the different reasons these women came to Japan, and the various difficulties they went through. Intimate Encounters is an enjoyable read, not only for students of anthropology, but also for those interested in either Japan or the Philippines. Thanks for this fine review, Elizabeth. One of the "text boxes" in a cultural anthropology textbook I use in an introductory course discourses on this issue and it sorta stuck with me. I am happy to know of this book and perhaps to get it somewhere. Although the world areas are different, these are the issues I think about and write about a lot. Thanks again!